The Digital Library of India (DLI) project, an initiative of the Central Government, aims at digitising significant artistic, literary and scientific works and making them available over the Internet for education and research. Begun in 2000 by the Office of the Principal Scientific Advisor to the Government of India and later taken over by the Ministry of Electronics and Information Technology, it has to date scanned nearly 5.5 lakh books, predominantly in Indian languages. Ananda Ranga Vijaya Champu by Srinivasa Kavi is a work in Sanskrit composed in 1752 on the life of one of the greatest chroniclers of South India, Ananda Ranga Pillai, the noted dubash. In 1937, Dr. V. Raghavan, the well-known scholar embarked on a project to edit this work and provide additional material by way of notes and Sanskrit commentary. This was published in 1948 and is the subject of this piece. Ananda Ranga Pillai was born in 1709 in Perambur. His connection with Pondicherry, where he was to make his name was a familial one, for his uncle Nainiya Pillai had been appointed the Chief Agent of the French East India Company in 1704. His father, Tiruvenkata Pillai, settled in Pondicherry along with several other merchants at the behest of Nainiya Pillai and became a successful businessman. While Nainiya Pillai fell out of favour with the French and died a prisoner, Tiruvenkata Pillai went from strength to strength and earned himself a respectable position. On his death in 1726, Ananda Ranga Pillai joined the government and in a span of a decade rose to become its Dubash. As Dubash, he was a close confidant of Francois Dupleix, the Governor General, and often his personal adviser. In addition to assisting the French with their trade, he carried on private trade himself and became extremely wealthy, becoming master of several villages, such as Acharapakkam, Tindivanam, Bhuvanagiri etc. That he wielded tremendous power was evidenced by the fact that he was the pivot of all negotiations between the French and Indian princes. Today, he is chiefly remembered for his seminal work, the diaries he maintained which chronicle the political and other developments that shaped the history of South India in the 18th Century. These were translated from Tamil in the early 20th Century and published as the Private Diaries of Ananda Ranga Pillai in several volumes. 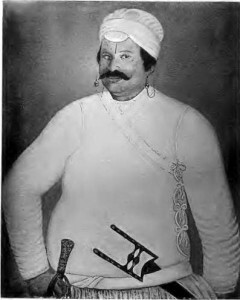 He was, however, not a pioneer in this regard, for he had only inherited the habit from his cousin, Chevalier Guruva Pillai, the son of Nainiya Pillai. Guruva Pillai’s diaries have not been recovered. Like several other dubashes, Ananda Ranga Pillai was a patron of several musicians, dancers and poets. Dr. V. Raghavan says that he possessed some musical knowledge too, which Francois Dupleix seems to have noted when informed by Pillai that his (Dupleix’s) glories had been composed into songs. The diaries also record that, at the specific request of Dupleix, an enactment of French exploits with songs composed by Kavi Kasturi Rangayya, one of the poets patronised by Pillai, was performed when the English withdrew from the siege of Pondicherry. Some of the Tamil poets who sought Pillai’s patronage were Sadasiva Desikar, Madhurakavi, Namachivayappulavar and Javvadhuppulavar. A Sanskrit poet who was patronised by him was Srinivasa Kavi, the author of this work. Nothing much is known about Kavi except that he was from the North Arcot district. In his preface to the book, Dr V Raghavan explains the significance of this work on two specific counts. One, it describes the battle of Ambur in 1749 (led by Chanda Sahib in a bid to capture power at Arcot, backed by Dupleix) and the murder of Nasir Jung in 1750 (son of Nizam-Ul-Mulk of Hyderabad) and secondly, for the fact that it explains the origins of the name Chennapatnam (held to be an abbreviated form of Chennakesavapura). Dr. Raghavan notes that the pages mentioning the battles which were missing in the diaries were later recovered and published and were found to corroborate the Champu, which attests to its veracity. It is interesting to note that the Vijaya Champu is only one of works in three different languages dedicated to Pillai, Kavi Kasturi Rangayya’s Ananda Rangaratchandamu in Telugu (published by Vavilla Ramaswami Sastrulu and Sons (in 1922) and Sadasiva Desikar’s Anandarangak-kovai in Tamil being the other two. With small stray verses dedicated to him in various Tamil anthologies by some poets in addition to the full-fledged eulogies, Ananda Ranga Pillai certainly is one of the most feted dubashes in the history of South India.